'Repulsive' German art is everywhere this year — just not enough of it. Strange Beauty is a strange name for the National Gallery’s selection of German Renaissance art. It’s certainly not a name that feels particularly accurate. A glowing octopus in a sea tinted red by algae — now that’s a strange beauty. Or a burning comet performing figure eights across the Andromeda galaxy. But Holbein’s double portrait of The Ambassadors? Or his marvellously upright depiction of Christina of Denmark standing before a gorgeous blue background: a likeness so exact, you could produce a made-to-measure suit from its dimensions? So the title feels forced. As does most of the selection it describes. 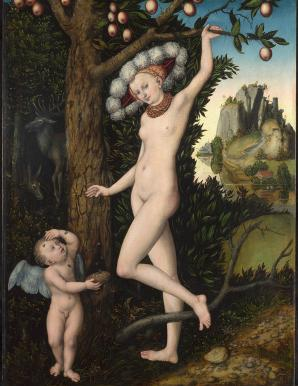 Yes, Cranach’s poster image of an elongated Venus smiling knowingly at the fate of her reckless son, Cupid, who has stuck his hand into a honey pot and is being stung by the bees as his reward, may warrant the description. But little else. This is as much a show about what is missing as it is about what is there. Of all the important schools of European art collected by the National Gallery, the German school is the most weakly represented. Putting aside the Holbeins, you can count the number of paintings of true museum quality in this display on one hand. Why? That is where it gets interesting. Most of the art in the show belongs to the gallery. A lot of the pictures are, therefore, familiar. But the background to their acquisition is not. And it is here, in the changing story of British taste, that the most telling information emerges. To put it in a nutshell: for most of its history, the National Gallery despised German art. Throughout all of the 19th century, and half of the 20th, German art was considered ugly, deformed, macabre and unworthy of collection. Sir Charles Eastlake, the gallery’s first director, dismissed the paintings of Matthias Grünewald as “repulsive”. In the 1888 guidebook to the gallery, the great John Ruskin complained that the figures in German art displayed far too much “enjoyment of horror and ugliness”. This dislike of German art had extraordinary consequences in the gallery’s acquisition history. In 1854, owing mainly to the efforts of William Gladstone, the chancellor of the exchequer at the time, the gallery acquired the immensely impressive Kruger collection of 64 German Renaissance paintings. Yet an angry British press turned quickly on the acquisition and insisted this early German art was “frightful”. In parliament, it was called “the worst ever” National Gallery purchase. So fierce was the hatred that two years later, in 1856, for the only time in its history, parliament passed a special act allowing the gallery to “de-accession” the Kruger pictures. Thirty-seven were sold. Ten were loaned out to provincial galleries. A few years later, in 1863, when Prince Albert’s family attempted to endow the gallery with his superb collection of early German art, the trustees refused to accept them. That’s why the Royal Collection today is so rich in German art, and the National Gallery so poor. All this is fascinating to learn. And it’s mature of the National to be so open about it. Unfortunately, as a result of these crazy fluctuations in taste, the present show has the measly demeanour of a thin man in a fat suit. The opening room is supposed to sum up the kind of art the National preferred while despising German art. Raphael’s gorgeous St Catherine is here. So is the Arnolfini Marriage. They hang side by side for the first time ever, I imagine. But instead of making anything clearer, they feel as if they have made the long descent into the basement just to fill a gap. The “strange beauty” trumpeted by the title — the German taste for distortion and artifice, combined inventively with precision and truth to nature — has lots of trouble coming into view. The show’s most ambitious moment involves the reassembly of the so-called Liesborn Altarpiece, painted c1465 for the Benedictine abbey in Liesborn, northwest Germany. The National owns various bits of it, and the ambition here was to evoke the altarpiece as it looked before it was cut into pieces in 1803 and scattered about the globe. But with so many sections missing and replaced by makeshift cardboard photos, you get a sense neither of completion nor of religious grandeur. What ought to be the show’s highlight, a central gallery devoted to Dürer, Cranach and Holbein, is another disappointment. The Holbeins are magnificent, of course, but the intense realism that makes them outstanding is almost the direct opposite of the strange beauty we have been summoned here to notice. As for poor old Dürer, the National simply doesn’t possess enough by him of a high enough quality to make any meaningful big points. Throughout the year, you will notice exhibitions examining various aspects of German art. They are happening because someone up there has decided that in 2014 our national institutions need to be celebrating the 25th anniversary of the fall of the Anti-Fascist Protection Rampart, as the East German authorities called it; or the Berlin Wall, as you and I know it. At the British Museum, another German show prompted by these same commemorative ambitions presents newer work by six German artists born in East Germany who moved to the West in the 1950s and 1960s. Why this life arc should have given these six artists such a fiercely Teutonic presence is unclear. But it does. I defy anyone to mistake the output of Georg Baselitz, AR Penck, Sigmar Polke, Gerhard Richter, Blinky Palermo or Markus Lupertz for anything other than German art. All the things the 19th century disliked about German painting — unworldly colours, strange distortions, unlikely reimaginings — were exactly the qualities that brought this particular group of artists to the world’s attention in the 1970s. They were bunched together as the neo-expressionists, and for their modus operandi they employed more or less the same methods as a mallet. Heavens, but they were scary. The BM has recently acquired an impressive selection of their graphic work. 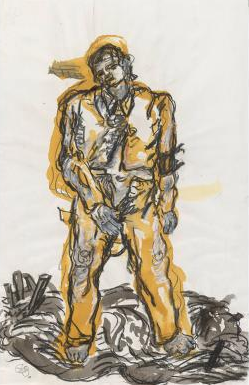 Baselitz, in particular, has something unstoppable about him. The dishevelled, lurching, bulky figures he produced in his Heroes series look as if they could survive a direct hit from a tank. And his notorious decision to paint everything upside down is so obviously perverse, I’m surprised parliament resisted the temptation to consider some de-accessioning again. Should we really be encouraging a Teutonic world-view as confrontational as this? « The man who gave British art a future.